$200 used to be the upper limit for me in terms of what I was willing to recommend here as affordable outerwear — and even then, five years ago, that was a stretch. We’ve talked about things such as peacoats, milsurp jackets, and chore coats before, which are easy to find second-hand for around $100. Barbour’s quilted Liddesdale slides in at just under $200. LL Bean’s Trail Model Rain Jacket is OK with things such as Shetland sweaters and jeans; their barn coat makes more of a statement and has a nice, Northeastern feel. But if you feel all these options are kind of boring, we wouldn’t argue. Finding good outerwear for less than $200 is tough. Like rare comets shooting through the night sky, however, this season has not just one, but two, solid outerwear options for $150. In 2018 menswear prices, that’s less than what some brands nowadays are charging for a shirt. Or one leg for a pair of trousers. Maybe a single Allen Edmonds shoe (not a pair, even at Factory Seconds prices). The first option is at J. Crew, where they have what they call a canoeist smock. 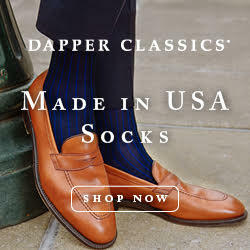 This is part of their Wallace & Barnes line, which is made from better materials than J. Crew’s mainline offerings and has more boutique brand feel. 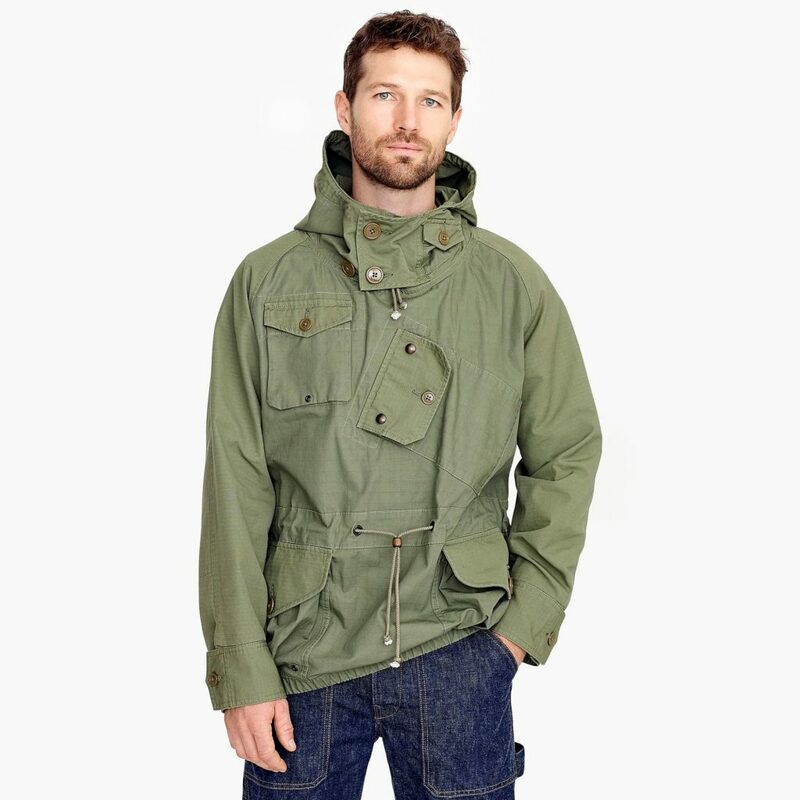 The anorak is modeled after an archival jacket worn by British Special Boat Service officers during the Second World War. It has a patchwork configuration of pockets: a stash pocket at the neck, slanted map pocket at the chest, and four other pockets throughout the body. The waist and hood have an adjustable drawstring closure, and the hem is tightly elasticated so you can adjust this on your body. 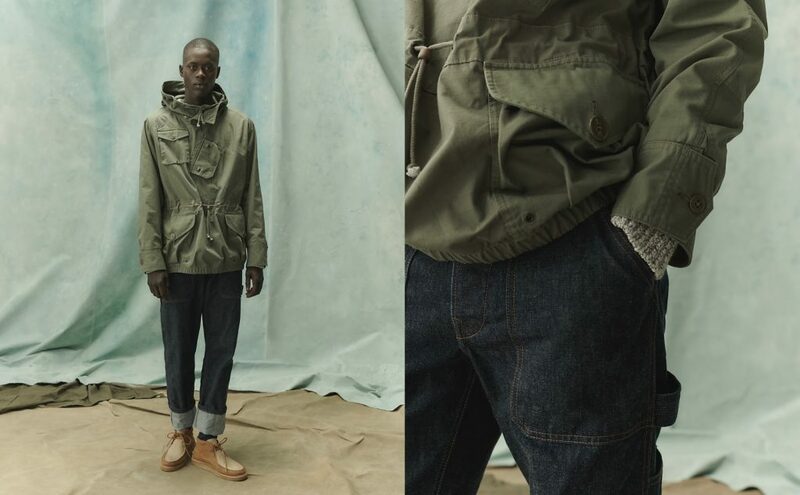 The smock isn’t for the timid, and it has a bold styling that you’d normally only see in lines such as Engineered Garments and Nigel Cabourn, but that’s also what makes is so great. More than just your basic parka or windbreaker, this has a designer sensibility that feels both unique and classic. It goes well with raw denim jeans or rugged chinos, work boots or Chuck Taylors. 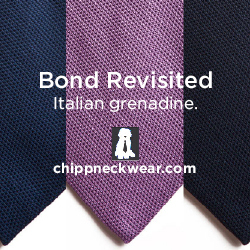 Since it’s a pullover style, you don’t have to coordinate with knitwear or button-ups. Just throw this on with a pair of pants and that’s your outfit for the day. For today only, J. Crew is offering this for $150 with the checkout code TGIF. It’s part of their Black Friday promotion (which has been extended until the end of today), but note that their site has been going down periodically. If you experience problems, just check back. The other option is at Abercrombie & Fitch. A&F has gone through a huge rebrand in the last couple of years. It’s a little less skeezy and fratty, although the stores are still too dimly lit for you to properly see anything. More importantly, the clothes are a lot better than what they were five years ago. The brand is now creatively headed by Aaron Levine, who formerly worked at Club Monaco, Jack Spade, and (for those who remember) hickey. Now he’s at Abercrombie & Fitch, taking out the company’s moose-logo’d polos and replacing them with contemporary classics such as shawl collar cardigans and button-down collars. This season, the company has a topcoat they call their A&F Dad Coat (making it dad coat AF). There are two versions. 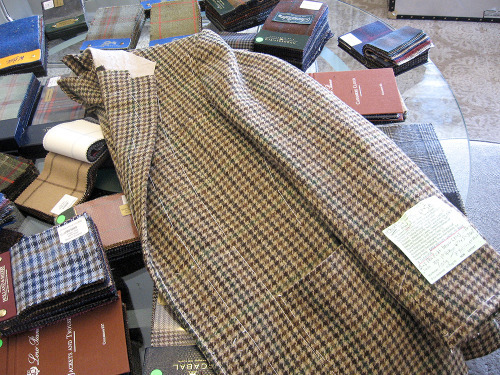 The brown houndstooth check one you see above was made from a spongey tweed sourced from Abraham Moon. 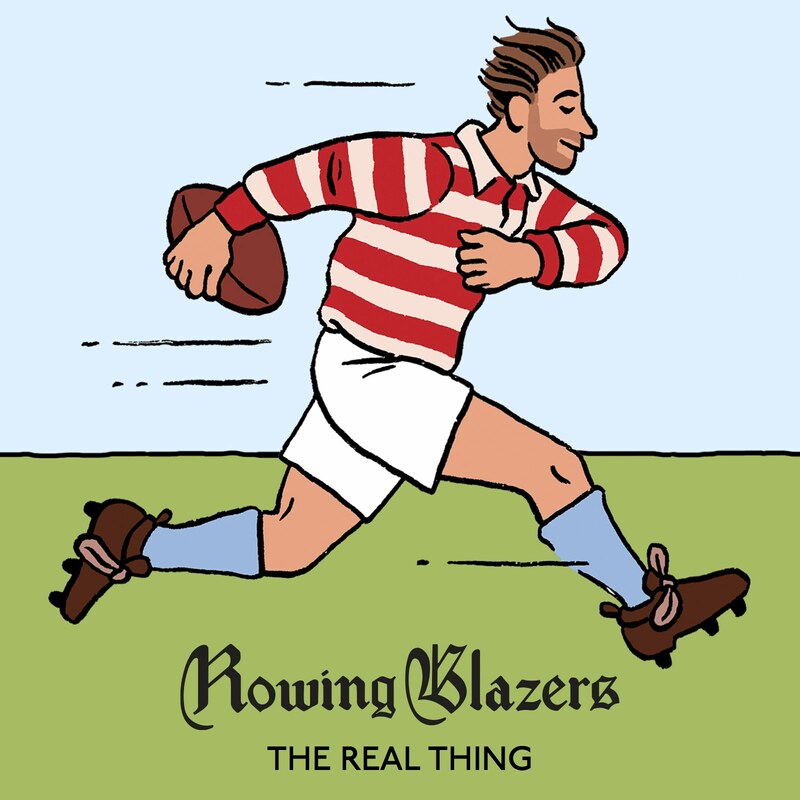 Drake’s and Sartoria Formosa have used the same fabric in the past for their ready-to-wear sport coats. It’s shown up at Pommella’s workshop. I have a sport coat from Anderson & Sheppard made from the tweed. 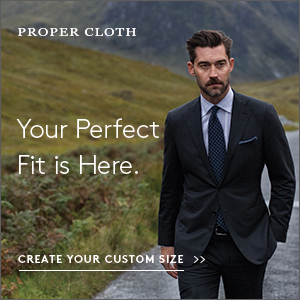 It’s a genuinely good cloth. The other version is a grey herringbone that’s made from a wool-poly blend. Synthetics aren’t always bad — designers sometimes use man-made fibers to get more control over how a fabric looks — but this is also a more affordable line, and sometimes polyester is added to a garment to strengthen what otherwise be weak, short fiber yarns. 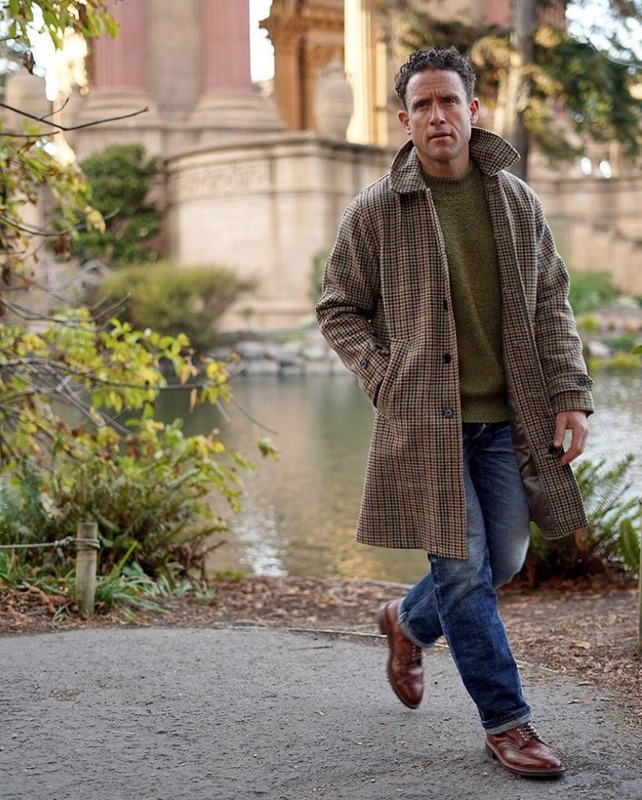 Ian at From Squalor to Baller has a fuller review of this coat and says the fabric has a flannel-y finish. Both coats are on sale today at 50% off, putting them at $150. The brown one will likely go better with earthy colors such as grays, burgundys, and greens, while the gray one might be better if you ever plan on wearing it with black jeans (although it goes well with blue jeans too). I like that the coat is more comfortably cut and not tubular slim, so it has some shape to it when worn. You can see how both versions look on Pete and Ian in San Francisco. The only catch: the coat is on the shorter side of being thigh-length. It’s still long enough where I don’t think it looks 2010-dated, but I wish it were a touch longer (my ideal is knee-length). On the upside, as Pete notes, slightly shorter coats look more contemporary and are easier to wear casually. Which is how most people will wear this, not with suits and sport coats, but with jeans and cable knits.